A soldier has admitted manslaughter by gross negligence after accidently killing his best friend in their living quarters during a tour of Iraq. L/Cpl Colin Theaker was "playing around" with a service pistol when he accidently fired a fatal shot at L/Cpl Scott Hetherington, from Middleton. In a statement, L/Cpl Colin Theaker described the shooting on 2 January 2017 as a "terrible accident". 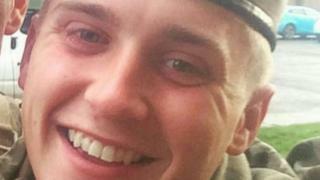 His death was the first British military fatality in Iraq since 2009. L/Cpl Colin Theaker appeared via video link from Weeton Barracks, near Preston, Lancashire, where he pleaded guilty to the charge at the hearing at Catterick Garrison court martial centre, the Daily Telegraph reported. The soldiers were helping to train local forces to fight so-called Islamic State (IS) when the accident happened, the BBC understands. L/Cpl Colin Theaker, who was part of a detachment from the 2nd Battalion The Duke of Lancaster's Regiment, was based at Camp Taji, north of Baghdad, when he accidently fired the single shot. The court heard how a solider in a neighbouring room allegedly heard the victim say something to the effect of "no, no, don't do that" which was immediately followed by a gunshot, the Daily Telegraph adds. L/Cpl Scott Hetherington had been serving in Iraq for a month at the time of his death and had welcomed a daughter Safaya-Rose three months before the shooting. The 22-year-old was buried with full military honours. Further reports will be presented on 8 March ahead of the sentencing.